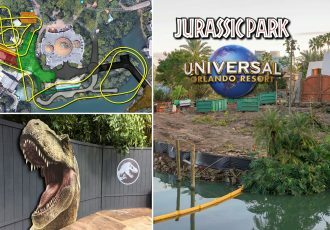 With the blockbuster film Jurassic World stomping all over box office records, Universal Orlando is wasting no time slapping the film’s logo all over the parks, especially in the Jurassic Park area at Islands of Adventure. 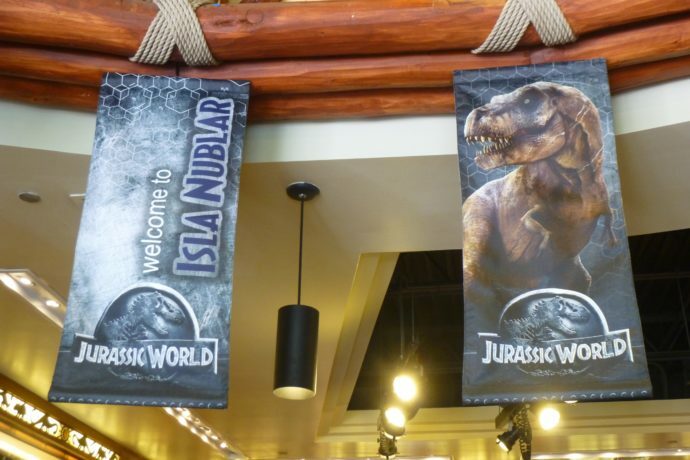 So far you’ll find Jurassic World banners and logos plastered all over the Thunder Falls Terrace restaurant and Jurassic Outfitters gift shop. 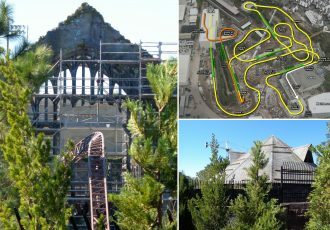 There’s signage for all the different attractions you can experience at Jurassic World, such as the Gyrosphere ride seen in the film. Unfortunately though, there isn’t (yet) an actual Gyrosphere ride here in Orlando. Maybe one day. There’s also a few new pieces of merchandise for Jurassic World at the parks, including some exclusive items. 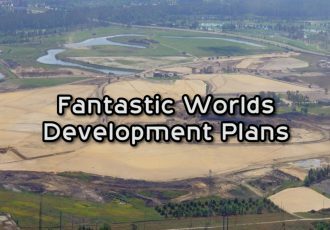 Jurassic World theming has not yet made its way to the Discovery Center or River Adventure, perhaps to keep those attractions in line with the original film, but who knows how far they’ll take the theming in the future. See the entire photo report below and stay tuned for more Jurassic sized updates! It’s like we’re in the movie! Perhaps because this restaurant is not mentioned in the first Jurassic Park film they felt it would be easy to slap Jurassic World all over it. After lunch let’s go on the Egg Spinner ride and then view a T. rex feeding! I do love the food at Thunder Falls. It’s nice be able to get something different than just a burger and fries at a theme park. Glad to see it so busy and refreshed. Jurassic Outfitters is located at the exit for the River Adventure ride. It’s the biggest gift shop in Jurassic Park. The banners really sell the Jurassic World concept. I wonder if we’ll see some on the pathways one day? This radio controlled Jeep Wrangler is new since my last visit, and is really hard to find in stores! 3D version of the Jurassic World logo, right near the store entrance/exit… getting sick of seeing it yet? Really busy, really hot summer day. So really long lines for the water rides. I’m not waiting that. Maybe next visit. ‘Experience the Dinos Up Close’ – Another park exclusive, Lanyards! 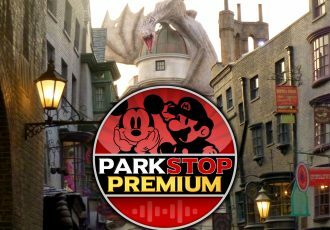 That’s all for this park update! Stay tuned to see what else gets Jurassic World-ized at Universal Orlando! That dippin dots stand is out pretty often. Nothing new. It’s been there for at least 3 years. Maybe not out every day during slow seasons though. This better be a permanent thing because I wanna go someday! 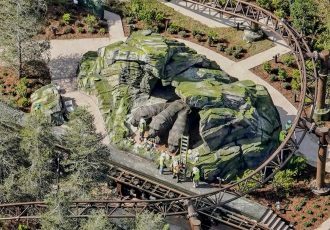 Even if the park was awesome in Jurassic World, the whole experience wasn’t good enough to wish to see that in a park like this. Maybe am I too old to understand all this buzz around this poor movie, and new generations will be fan of this one as I was with the first one. But a shame to replace references and signages of Jurassic Park with those of Avengers Park !